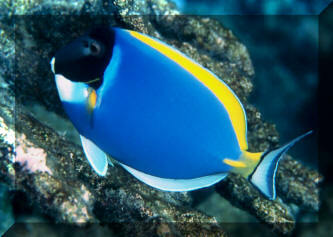 Amongst the more difficult marine fishes to keep is the Powder Blue Tang. Yes, though it is amongst the most commonly offered species of Surgeonfishes you see at retail fish stores, this Indian Ocean beauty rarely lives for more than a few days to weeks in captivity. It is likely a host of contributing factors that make Acanthurus leucosternon such an easy-dying species for aquarists. The fish takes a beating being held and shipped from such long distances through the chain of custody to the "end user". It is also one of the species of fishes that has a large (dozens to hundreds of square meters) territory in the wild and doesn't take well to the "small clear boxes" which are our tanks. Lastly, this is clearly a "grazing" species that samples algae and related benthic infaunal organisms on a continuous basis during the day, and frequently succumbs to a lack of nutrition. However, there are some "success stories" with the Powder Blue and some solid points to make that greatly increase ones chance of keeping it in an aquarium. Here I'd like to offer my observations, accumulated first and second-hand experience with what DOES work in maintaining Acanthurus leucosternon alive and well. Acanthurus leucosternon Bennett 1832, the Powder Blue Tang. I can hear some of you screaming, "this isn't a difficult fish!" "I've known people to keep the Powder Blue for years!" Most specimens don't make it. Those that are well received and cared for sometimes do live for a good long time. Two maxims for success: One to a tank, and lots of live rock with algae. Bad specimens of A. leucosternon are easy to spot. Most have darkened blue body areas, perhaps with a white "stress" bar, torn fins, and other evidence of accrued shipping and handling damage. Decent specimens are harder to assess. These all have the quality of "brightness", that is, clear eyes, constant movement and an awareness of your presence. "Spaced-out" specimens should be left. Index of fitness is a fisheries term for the "fullness" of fish bodies. It's quantified as the circumference of an animal divided into its length. Specimens with a higher value are obviously fatter than ones with lower indices. You want to select for a Powder Blue that is not too thin, particularly in the upper body area (the flank, up and behind the eyes). Skinny specimens rarely recover. Some "flashing" or scratching is to be expected of all specimens, but this should not be excessive. Nor should respiration be labored or too frequent. About sixty gill movements per minute are what you are looking for. Newly arrived specimens are better to sort amongst other than longer-on-hand ones. Like most marine livestock, and particularly Acanthuroids, Powder Blues are "starved out" for a few days ahead of shipping to reduce in-transit pollution in their shipping bags. Unfortunately this starvation can be persistent once the animals are received and shipped through wholesalers, jobbers to your LFS or etailing supplier. Buy or special order "fresh" A. leucogaster and promptly take them home, quarantine and place them. Powder Blues are one of the notorious "ich magnet" species of Surgeonfishes, and should definitely be quarantined for at least a two-week period of time before being introduced to the main/display tank. Even then, they will be amongst the first to show signs of pathogenic or environmental disease should something be amiss. If you'd like, do consider adding a prophylactic freshwater dip/bath (of a few minutes duration) to the acclimation to quarantine process. It's advisable to add Methylene Blue to the pH-adjusted freshwater to both increase its capacity for oxygen holding as well as calming the dipped specimen. This is a wide-ranging, fast-swimming vigorous fish that needs plenty of room. The smallest tank I recommend for their keeping is one hundred gallons. At full potential size of about a foot in length, this would only be six times the length of the fish… not too much to ask for. 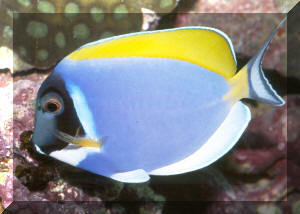 Acanthurus species do best in reef aquariums, or at least ones with plenty of healthy live rock. Powder Blues will not survive in a sterile "fish only" setting. About tank shape, less "show" and more "standard" tank dimensions are preferable. Lots of rock to graze on, zoom about is of more use than the room to swim up and down. The age of the system is important on two principal counts, maybe three. More aged systems are best because they will be more stable chemically and physically, as well as likely having more filamentous algae to graze on. By waiting for six or more months before introducing your Powder Blue, you are likely placing it as your last fish, the proper order of introduction. Organics should not be allowed to accumulate in this fish's tank. 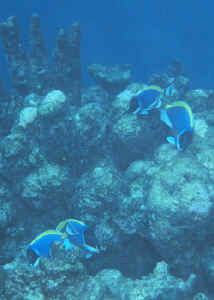 Amongst reef fishes that "show" signs of nitrate et. al. concentration, Powder Blues rate up near the top. Oversized filtration, circulation, aeration and skimming, along with the use of quality salt-mix (e.g. Instant Ocean, Reef Crystals, Tropic Marin) and regular water changes are necessary. Nitrates should not exceed any more than 10 ppm; pH should not be allowed to drop below 8.2. Temperature can play a pivotal role in Powder Blue health. They are happiest in warm water, something in the low 80's F. If yours shows signs of disinterest in feeding, consider elevating the tank temperature. Nutrition or should I state, a lack of nutrition is likely the principal cause of loss of this species in captivity. Too often specimens arrive too starved to recover and/or are placed in circumstances where they cannot sustain themselves. It may seem counterintuitive but there is reason to believe that supplying a "fully nutritional" staple food is of at least as much benefit as being conscientious about having greenery available at all times. I have seen very healthy Acanthurus leucosternon that have been fed only on "Spectrum" (New Life International, Inc.) foods for instance. Similar appearing fishes, and ones utilizing about the same ecological niches should not be placed with Powder Blues. Other Tangs will often be challenged, sometimes to the extreme, and other algal grazing fishes may not fare any better. As they can be overtly territorial, it is best to place your Acanthurus leucosternon as the last fish in the system. On the issue of how many, one is the magic number for all but the more huge (thousands of gallons) systems. Though they're sometimes encountered in the wild in shoaling schools of hundreds of specimens, most often there is incessant fighting with more than one in an aquarium. Powder Blue Tangs have had a dismal survival history as aquarium specimens. Their easy loss is attributable to inherent poor adaptability to captivity, as well as the rigors of collection, holding and shipping from afar. Folks who would successfully keep this fish can undertake several ameliorative measures. Careful selection, provision of adequate habitat and feeding most notably. Folks who would keep Acanthurus leucosternon are advised to pay attention to the above points or seek out more suitable aquarium fishes for display. Fong, Jack. 2000. The Powder Blue Tang- hardy or delicate? FAMA 3/00. Kuiter, Rudi & Helmut Debelius. 2001. Surgeonfishes, Rabbitfishes and their Relatives. A Comprehensive Guide to Acanthuroidei. TMC Publishing, Chorleywood, UK.